Say hello to my little friends, R.O. & I. Yes. Return on investment have become the bane of an entire new media industry. However, avoidance is not the answer. While the question of “what’s the R.O.I. of social media” is difficult to answer, it is necessary as it forces us to dig deeper. The result is maturity. This conversation is important as you are expected to answer it not just today, but and also over time. The source of the question though, may also impede innovation and experimentation. Why? The answer in of itself is as elusive as the question asked. As much as the previous sentence sounds like a riddle, it is a very real observation. Often it is asked without a clear understanding as to whether or not the answer will actually change the company vision or the current course of business. Sometimes it is genuinely asked to do just that, change the vision and the course of business toward relevance. Either way, this is an opportunity to show how new media enables desired business outcomes. Your job is to connect the dots between the value of new media, the expectations of your customers, and the business roadmap the company is operating against. So, when it comes to R.O.I. in social media, perhaps we’re asking the wrong question. Again, the answer is difficult, but not impossible to answer. If I ask you, “how are you?” you will probably respond with “fine,” “ok,” “good,” or “great.” But if you take a moment to think about it, each of those answers begs a follow-up question to deepen the conversation, “why?” Or, “why do you say that?” Otherwise the question serves no real purpose other than to casually acknowledge another person or to run through the traditional ritual of easing into a conversation. The same is true for R.O.I. If we are indeed to discover the “Return,” we need to tie it to more than the “Investment,” we need to understand the circumstances, intentions, and potential impact and outcomes business leaders need to see in order to understand new or foreign opportunities. Said another way, we need to define the “R” that defines tangible success and work out a formula that allows us to find the answers. Therefore, R.O.I is specific to an outcome or a goal, which means that there is no one answer. As we see in the executive quote earlier in the post, tying social media to business objectives and metrics helps them see a clearer picture. We have to remember that executives most likely do not use social networks personally. It’s impossible for them to see what you see, therefore taking the extra time to connect the dots helps you make the case and in doing so, brings the R.O.I. answer into focus. Susan also does a wonderful job of not only showing us how businesses should view R.O.I, but she also helps businesses identify how to develop analytics frameworks that define the “R” or the return for specific business objectives. Remember, there is no one way to measure R.O.I. There are many business pillars that stand on a solid foundation for growth. Susan introduces the Social Media Measurement Compass to guide businesses as they’re planning social media programs. Remember, social media doesn’t just belong in the marketing department, a social business is customer-centric and social media enables more effective engagement, learning, and adaptation. Therefore, it is the responsibility of other critical business functions to engage. 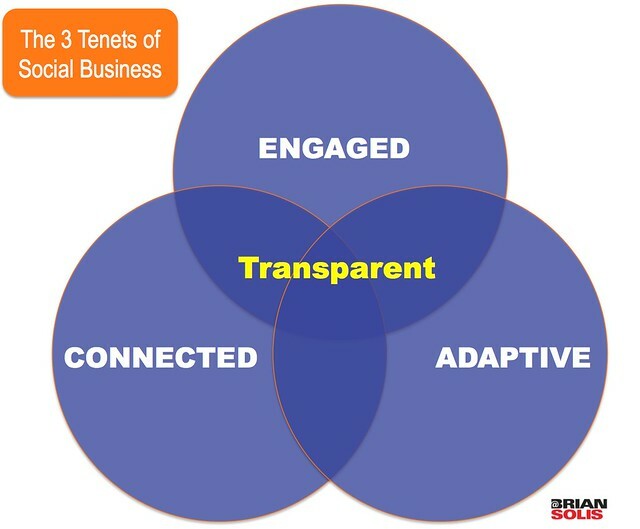 The three tenets of social business, Connected, Engaged, Adaptive create a transparent relationship with customers that opens the door to meaningful metrics to measure success and improve everything in between. In the end, understanding the relationship between business objectives and social media tactics will create a series of relevant strategies and critical links that in of themselves serve as opportunities for measurement and the establishment of R.O.I. You can download Susan’s report here and also follow her on Twitter for more insights into metrics and analytics. Pre-order now at Amazon | Barnes and Noble | 800CEOREAD. Click here for your favorite infographics…now in 22 x 28 poster format! My new favorite article from you my Master! Great job! Thanks for bringing Susan’s report to our attention. It certainly helps me present better information to my CEO. Or at least present it more clearly. I’m starting to look at social media as an extension of different initiatives to improve various processes similar to the long train of CRM. So much to learn, but at least I’m excited about it! I love this article! Brilliant! As Kaplan and Norton point out in the Balanced Scorecard framework (employed by the majority of the global 5000 I understand), intangible assets (eg, reputation, brand, social media engagement) have no value in isolation. They only have value “in the mix”. This is why we find it so difficult to determine a dollar value ROI for things like the Windows 7 upgrade, the rebrand, the training and development programme, the ad campaign, and social media engagement. It’s why I extended the framework into the Influence Scorecard in my book The Business of Influence, and I couldn’t agree more with your assertion Brian that “there is no one way to measure R.O.I.” The contribution of social engagement is as unique as your asset and tactical mix, as your strategy, as your business objectives, as your marketplace. I’m not entirely clear however how the social media measurement compass fits in. It is far from exhaustive to act as a checklist (eg, it doesn’t list engagement via social media for internal communications, for recruitment, for innovation with suppliers), and I don’t see how it helps with step 4, if I’m reading the sequence above correctly that is. Like the article but have a question. Should the metric of success be a decline in call center traffic, or an increase in customer connections? I believe every connection is a gift, even complaints, and think customers should be given all options to connect with a company, according to their own personal preference. Whilst it is true that some may prefer to move from the call center to the web, hopefully social media provides an additional outlet for those who did not contact by phone in the past. Hi, Denys! Social media will continue to offer an additional venue, not the only one. It’s our responsability to show customers it’s this way. Social media is not meant to replace other marketing venues and tools, it’s simply an additional one. For those who feel more comfortable callling customer service and talking with a live person, call center will continue to be the best option. After all, it’s about developing the relationship focused on your customer. Have a great day! I do find your post, Brian, really convenient specially at this point in time where small business owners are looking to develope their social media presence as a venue to increase their business. It is great the way you put it all together to make it clearer for them to understand. If they approach social media thinking on “pennies and dimes” then they won’t see the real value of developing long term, mutually beneficial relationships with their customers. Sharing it! business in-group that understands these things. I go in the same way as you. What is the ROI? I think there should be some basic definition and then, some related examples get out of the article. Confused bit! A simple way to look at is this: what is the measurable benefit you get for investing time into an activity. Think about it in terms of farming: you spend money on land, you purchase seeds, you work the soil, and you add water. This takes time and money. But, when the seeds grow into plants (as a result of your effort) you now have something you can use: food (which you can eat or sell). The question of ROI (return on investment) is a question of: was all the money I spent on my farming tools and the effort I spent using them worth the food I got out of it? If it was, that’s a win. If it wasn’t, that’s a loss. In social media, it works the same way. The time you spend using social media should deliver some sort of results (maybe it is pageviews on your blog, maybe it is customers for your business). If the results you get from the effort are worth more than the amount of effort you put in, then you will be successful. And remember, both the investment (the effort and money you put in) and return (what you get as a result) can be measured in many different ways. Brian is showing some of those different ways in this post so that you can have a framework to measure your effort versus your results. I hope that made things better, not worse. Or else this comment has a terrible ROI. 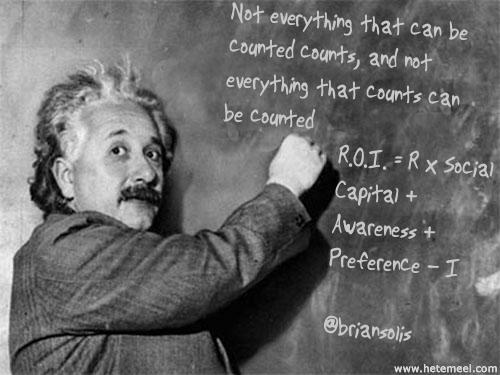 ROI = Return on Investment, it is a part of Accounting or Bookkeeping. Maybe he didn’t know he had to dumb it down for someone, in this day & age, who doesn’t know what ROI means. Google things before you make yourself look stupid next time. Who doesn’t know – people NOT in BUSINESS – like retired folklorists. We also read posts, and in my world we know to make writing as clear as possible for ALL. As someone else said, ROI stands for “return on investment” (basically, how much revenue will be generated [return] if a company spends money on something [investment]). It’s not just a bookkeeping or accounting term, though. Decision makers in all business areas use it. For example, if a marketing manager spends $500,000 on an advertisement that leads to $5 million in new business, that would be a good ROI. By the way, ignore losers who criticize you for asking an honest question. I think Kareirei is right. You have to define your terms, like ROI: return on investment, to be understood properly. Brian, thank you for writing this article! I finally have an answer for my owners who don’t understand marketing or social media and don’t have a clue about what I do. For the past 20+ years their business didn’t even have a business or marketing plan and I have spent the past 2 years trying to educate them about demographics, social media, SEO, advertising, etc. and their only question is about ROI because that’s the only term they know. I’ve been trying to tell them about investments in time in terms of growth and reach of customer base and ROI isn’t always about dollars and cents, but a longer term investment. But “engagement” and the points on the Social Media Compass are excellent ways to demonstrate it to them. Thank you! Anyway, working on a book on measurement now – and going deep into the ROI – and I’m banning the use of the word for nonprofits … using “theory of change” instead. Great post as usual Brian! Excellent guide, I just downloaded the report from SlideShares, looks very interesting and very detailed. Fantastic article. As a business consultant and chair of the business school of a Midwest university I completely agree that any business strategy (such as social media) must fist align with the overall business objectives. So many business owners get enamored with “shiny things” and create opportunity costs with diverting their resources.